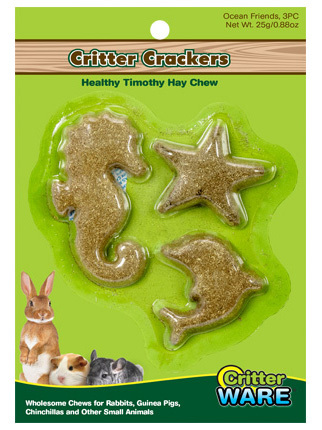 Ware Pet Critter Crackers are compressed timothy hay treats that come in a variety of fun, animal-inspired shapes. These natural, high-fiber chew treats help with digestion and keep teeth clean and trim. Timothy hay is essential to your small animal's overall health. Chinchillas, guinea pigs and rabbits are plant eating animals requiring a diet rich in hay and grass.